This client had a very dull corner of the garden with a couple of old shrubs in entangled with a huge grapevine. She wanted to brighten the area outside her back door and to be able to get to the grapes for wine making. 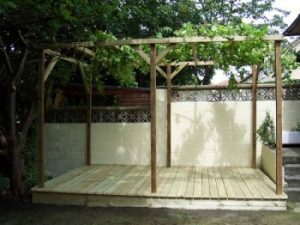 After clearing out the unwanted shrubs we constructed a decking with a pergola over the top. We tidied up the vine and laid it over the pergola. Light now streams into the garden through the newly created clearing whilst the grapevine gives a little dappled shade over the new decked seating area.